The British woman’s lust for the fuller brow is yet another Kate Middleton-driven craze, this time brought about by her former predilection for hearty, well-conditioned eyebrows. And not only has a Harley Street clinic spoken of a spike in numbers of patients wishing to undergo their non-invasive eyebrow hair implant surgery since the Royal Wedding last April, but now an eye make-up brand has developed a brow-plumping product promising to give your eyebrows a make-over fit for a duchess. Dr. Raghu Reddy, one of the UK’s leading hair restoration experts, performs eyebrow transplants at The Private Clinic on Harley Street, using hair from behind the patient’s ears. The procedure – which costs between £4,000 ($6,200) and £5,000 ($7,800) – is used as a solution for those who have over-plucked their eyebrows, or those who are simply looking for a fuller brow. Dr. Raghu Reddy said: “We have witnessed interest in the eyebrow transplant procedure grow since around the time of the Royal Wedding and it has steadily risen. “Now we have a healthy stream of women who come into the clinic and undergo the treatment. There is also greater awareness now of the procedure and the results it can achieve. “While I do have patients who come to me who have over-plucked their brows, I also have women who come in with perfectly normal eyebrows, who are looking for a thicker, fuller brow to rival the likes of Kate Middleton. Meanwhile, Eye Candy has released a new product which claims to enhance the appearance and length of eyebrows. 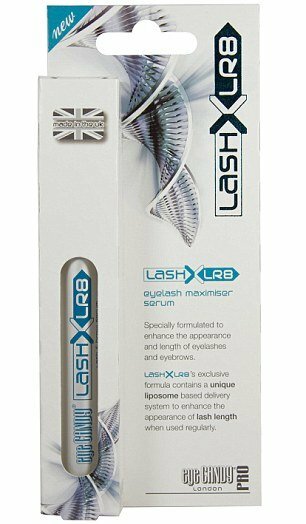 The new LashXLR8R is aimed at those who want to give their brows a natural boost, without the use of eyebrow pencils. The serum is already being hailed by make-up artists and has been proven strengthen and thicken lashes and eyebrows in just four weeks. Prior to its launch, the product had a waiting list of 8,000, but it is now available in Boots for £19.99 ($31). Developed in the UK, the brow-booster has been formulated with a unique liposome-based delivery system, containing natural seaweed extracts Laminaria Digitata and Pelvetia Canaliculata. These naturally occurring minerals are known to stimulate growth and increase brow density and lash length. The serum, which is paraben-free, also contains D-Panthenol (Vitamin B5) which helps to improve lash flexibility, the condition and moisturisation of both lashes and brows. Performed by Dr. Raghu Reddy, one of the UK’s leading hair restoration experts, at The Private Clinic on Harley Street, the eyebrow transplant uses “third generation follicular unit extraction” (3G FUE) to provide a solution for patients who have over-plucked their eyebrows beyond repair, or to those who are looking for a fuller brow. The eyebrow transplant enables those patients who would like a fuller, thicker brow to achieve that result. • The treatment itself lasts around 4-5 hours and it is virtually pain free. • The hair will then grow gradually in its new location and you will start to see growth within 3-4 months. • It costs between £4,000-£5,000 ($6,200-$7,800), depending on the patient, the desired result and the number of hairs required.